The Global Volcanism Program has no activity reports for Amiata. The Global Volcanism Program has no Weekly Reports available for Amiata. The Global Volcanism Program has no Bulletin Reports available for Amiata. Amiata is a lava dome complex located about 20 km NW of Lago di Bolsena in the southern Tuscany region of Italy. The trachydacitic domes and associated lava flows were erupted along regional ENE-WSW-trending faults. 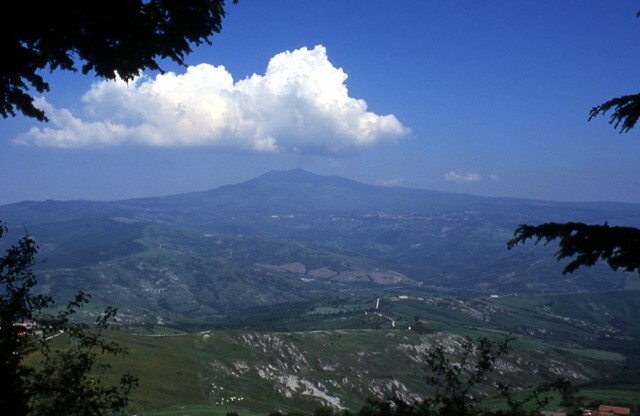 The largest of the domes is Monte Amiata (La Vetta), a compound lava dome with a trachytic lava flow that extends to the E. A massive viscous trachydacitic lava flow, 5 km long and 4 km wide, is part of the basal complex and extends from beneath the southern base of the Corno de Bellaria dome. Radiometric dates indicate a major eruptive episode about 300,000 years ago. No eruptive activity has occurred during the Holocene, but thermal activity, including cinnabar mineralization, continues at a producing geothermal field near the town of Bagnore, at the SW end of the dome complex. Cadoux A, Pinti D L, 2009. Hybrid character and pre-eruptive events of Mt Amiata volcano (Italy) inferred from geochronological, petro-chemical and isotopic data. J. Volcanol. Geotherm. Res., 179: 169-190. Ferrari L, Conticelli S, Burlamacchi L, Manetti P, 1996. Volcanological evolution of the Monte Amiata, southern Tuscany: new geological and petrochemical data. Acta Vulc, 8: 41-56. Krafft M, Dominique de Larouziere F, 1991. Guide des Volcans d'Europe et des Canaries. Lausanne, Switzerland: Delachaux and Niestle, 455 p.
Van Bergen M J, 1985. Common trace-element characteristics of crustal- and mantle-derived K-rich magmas at Mt. Amita (Central Italy). Chem Geol, 48: 125-135. The Global Volcanism Program is not aware of any Holocene eruptions from Amiata. If this volcano has had large eruptions (VEI >= 4) prior to 10,000 years ago, information might be found on the Amiata page in the LaMEVE (Large Magnitude Explosive Volcanic Eruptions) database, a part of the Volcano Global Risk Identification and Analysis Project (VOGRIPA). There is no Deformation History data available for Amiata. There is no Emissions History data available for Amiata. The Global Volcanism Program has no photographs available for Amiata. There are no samples for Amiata in the Smithsonian's NMNH Department of Mineral Sciences Rock and Ore collection. Large Eruptions of Amiata Information about large Quaternary eruptions (VEI >= 4) is cataloged in the Large Magnitude Explosive Volcanic Eruptions (LaMEVE) database of the Volcano Global Risk Identification and Analysis Project (VOGRIPA).